Wisconsin Gov. 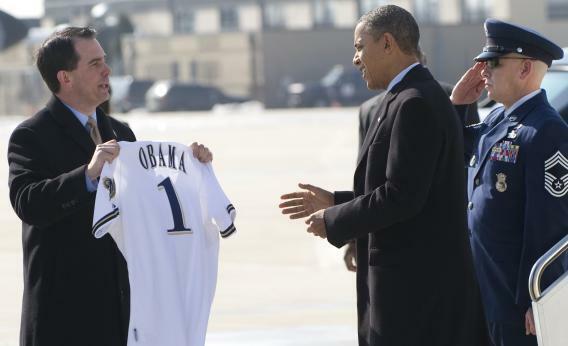 Scott Walker hands President Obama a Milwaukee Brewers jersey as he disembarks from Air Force One upon arrival in Milwaukee on Feb. 15. Must all politics be presidential? Tomorrow Wisconsin’s voters will decide whether to boot Republican Governor Scott Walker in favor of his Democratic challenger, Milwaukee Mayor Tom Barrett. Polls show Walker slightly ahead. Now for a few ways in which it’s different: 1) It’s a recall. 2) It’s happening in June. 3) The incumbent is a Republican. 4) Neither Barack Obama nor Mitt Romney is running. 5) A significant number of states (49 by my count) will not be participating. 6) Need I go on? If Barrett pulls out a come-from-behind victory, that will perhaps show us that crossing big labor can still carry a heavy political price in a Midwestern manufacturing state. A Walker win might convince Romney that he has a good opportunity to take Wisconsin if he fights hard there. And for the most serious students of political campaign machinery, like my colleague Sasha Issenberg, the tactics the two sides are using might hold some subtle clues as to how the national battle will unfold. But really, as long as the results are close, whether Walker pulls 53% or 46% doesn’t really tell us much at all—except for that one minor detail of who will govern the state of Wisconsin. Oh, and for those desperate for some kind of inkling of which presidential voters will choose in November: We could always ask them.